The last couple of days have been rainy and so I haven't been out to check what we call "the chicken house" garden bed. You might ask why the name. Once the people we were then, younger, stronger and oh so much more enthusiastic had a chicken house on that very spot. Along with, of course, a number of mixed breed chickens who laid some great eggs and raised a few broods of chicks. Vermin and stray dogs slaughtered the chickens and we did not replace them. 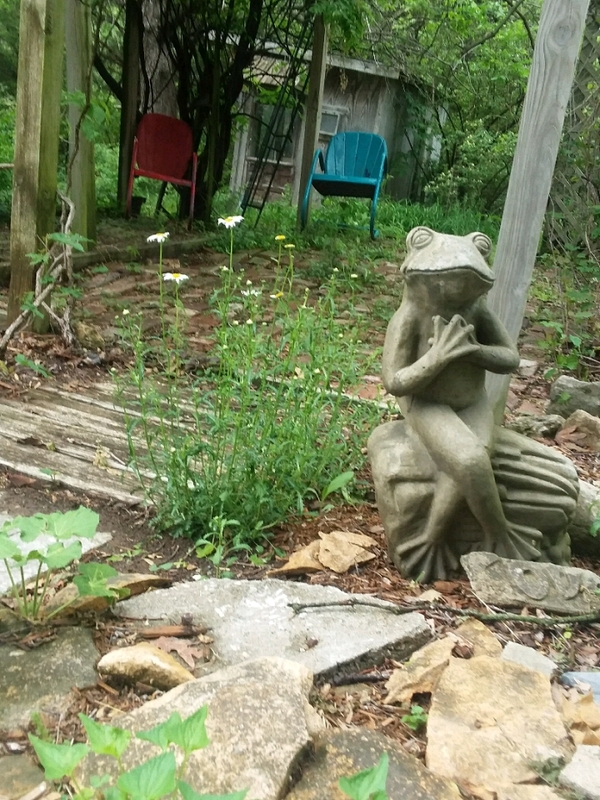 The house was torn down and left a nice space to turn into a garden. 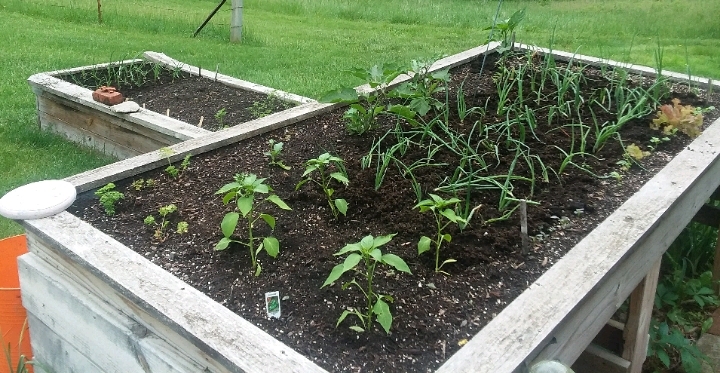 Various crops have grown there, corn, raspberries, and tomatoes et al. This year it became the home of the onions, mustard, kale and collard greens. The husband put the onions in early and then we had the 5 inch rain which washed them hither and thither, then the dry spell that did them no good at all. Most recently the smaller softer rains have brought up what we call "quack grass." It is everywhere and while not difficult to pull, incredibly abundant. Along with the poor germination, the onion plot was looking like a loss. So I think, why not move the living ones to one of the raised bed? The husband agreed that we might save some that way. Thus together we moved over 100 onion starts in various stages of growth. The clouds overhead bespeak rain and that would be so sweet to settle them in their new beds. Will the onions be saved? Stay tune for another episode of tales from the veggie garden. He is fun, as things go around here, a new addition. Those onions are lucky to have someone looking after them. They shall henceforth be known as "the lucky onions,"
I can see why you went out of chooks. Also, what a handy place to put your veges. Funnily enough Gyro, who used to live in Tasmania, had trouble with quolls getting his chooks. Because he could not make that chook house quoll-proof (they can squeeze through the tiniest of cracks around door and things), he built a new, triangular chook house, and then grew vegies in his chook house! He said they grew very well, but he was putting compost in there. He also put an alarm on it, because possums were getting in there and eating his veges! His neighbours thought it was hilarious, hearing his alarm going off. These days we would use a night camera with a sensor. So, chook yards are good vege growing areas! I wish your onions luck. And your other veges. Growing veges and having chooks can have their reverses at times, but we remain ever hopeful! Interesting story hearing that someone else so far away used their chicken house for veg growing. Indeed we do remain hopeful, without that life would be no fun at all. Maybe people do that the world round. Yes, without hope we wouldn't be motivated to do anything at all! Definitely my favourite LJ subject title this week! Pleased that you like the title. LOL The Suspense of the Onions! Poor chickens of the past, we had the same issue with some wild predators eating ours at my father's village, so he was forced to move the next batch to a safer house. Poor chickens, they have it hard, easy prey and all they know to do is run about and cluck. "Will the onions be saved? Stay tune for another episode of tales from the veggie garden." The raised beds are a lifesaver for us old timers.